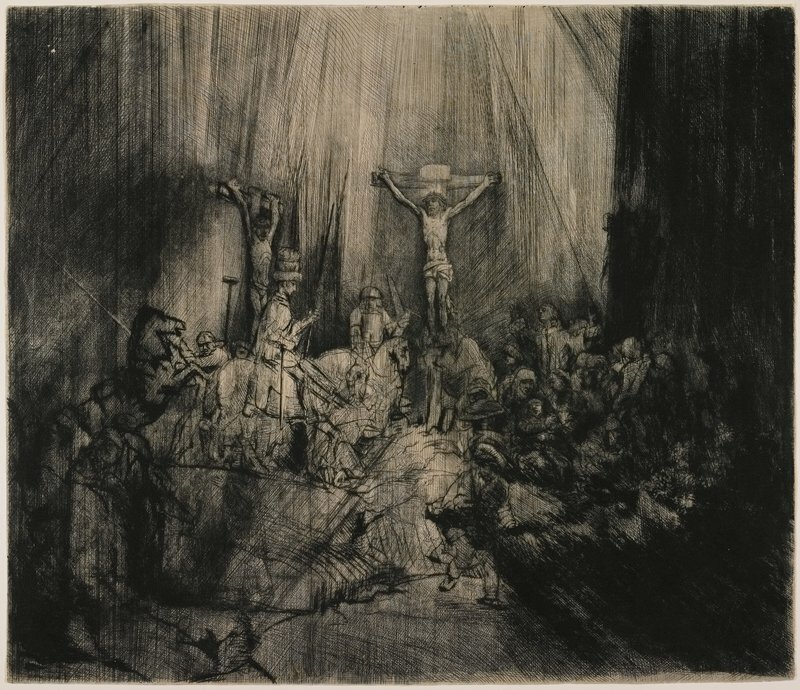 Rembrandt's grand interpretation of the Crucifixion probably developed in tandem with his Christ Presented to the People. It started out as an operatic extravaganza performed in a radiating cone of light. Rembrandt's revision of the Crucifixion scene was even more radical than his obliteration of the crowd in the judgment scene. He changed many details of the image. The horse in the earlier version has been reversed and received a rider in this later one. The centurion no longer looks up at Christ; instead, he bows his head in remorse. But most dramatically, Rembrandt took his etching needle firmly in hand to lacerate the printing plate, throwing the scene into chaos and darkness. He had never executed anything like this before or after. In fact, nothing would truly compare until the advent of expressionist art in the 20th century.